I wasn’t all that enthused about being a boy scout as a kid, but one memory stands out from that time as a big moment of self discovery. When I was about 9 years old I remember making a foot stool during one of our weekly meetings. It sounds lame but it hit everything on my list and it was the single most enjoyable “craft” I made during my (roughly 6 year) scouting career. The stool had a sturdy wooden frame with a woven rope top. I had always enjoyed making things out of wood, but it was the woven top that had me totally drooling with creative excitement. I remember watching a few of my friends lose interest but I had this itch to make that woven section as neat and strong and tidy as possible. I’m still chasing whatever part of my brain came alive that evening. 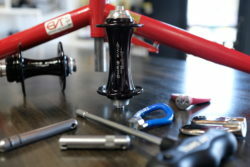 I’m sure there are dozens of entries & articles about the “art of wheelbuilding” and all the gooey feelings bicycle mechanics share for the process, and it’s not my intention to contribute blown smoke to a hip cycling topic. 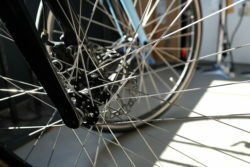 There is something so purely foundational, though, about building solid bicycle wheels which makes it worth sharing. That part of me that I discovered as a scout touches on the joy of creating something of quality by hand, but that isn’t the most important part. To me, what’s so wonderful about this particular topic is that it demands patience and thorough planning at such a basic level that it’s so applicable to life and so humbling when the whole thing fails. If you’ve built wheels you know there’s a formula for spoke length and all the variables need to be spot on or the project just doesn’t work. When defining these variables, there’s no better route to success than taking each project as if it were a new one. Likewise, there’s no quicker route to pulling your hair out than relying on a few measurements found online and an equation you’ve only run once. That’s not a jab at the internet, rather it demonstrates the importance of measuring by hand the materials in front of you, slowing down to be precise, and looking at the whole project from a birds eye. The first few times you can’t seem to dish a wheel or remove a hop or achieve proper tension, you see how important it is that each preliminary measurement is taken with care. An intentional foundation produces a useful result. How valuable a lesson in life? How much of what we do is in motion without conscientious examination? With the appreciation for process comes the appreciation for good materials. We keep our arsenal of components somewhat small, using what we’ve found works and produces the most amount of success for specific disciplines. Probably 95% of the time we use Chris King and White Industries hubsets for road and off road applications. In terms of rims, most often we build with HED Belgium plus alloy rims at a higher spoke count (28h & 32h). Jan Heine, editor at Bicycle Quarterly, shares a few words about the Belgium plus rim. ENVE is our go-to for custom carbon wheelbuilds, though a Zipp hoop builds up extremely well with a quality hub. Wheelsets with these materials are durable, fast, & pair well aesthetically to our bike builds. There’s a lot of talk on 700c vs. 650b that we won’t get lost in, but for road and gravel riding we most often use 700c and generally reserve 650b for high volume-adventure-all road situations. If your frame clears a 48mm+ tire in 650b then it may be a useful size. Head over to our Instagram page to see our latest wheelbuilds.